For several days, we went to bed and woke up to high winds. “Most unusual at this time of year!” just about any local would tell me as I asked about the wind. Tim and I were scheduled to go sea kayaking on our last day, weather permitting of course, and I feared it would be cancelled because of the winds. 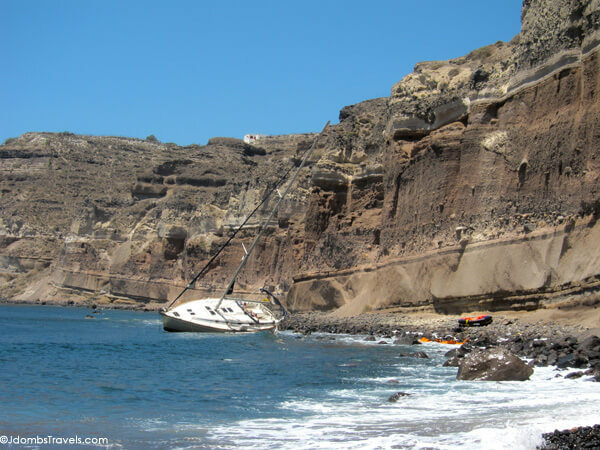 Unfortunately, the winds kept up and we couldn’t do our original program to cross the Caldera from Oia and kayak across to the island opposite Santorini, Thirasia, where we were to have a picnic and watch our last sunset. 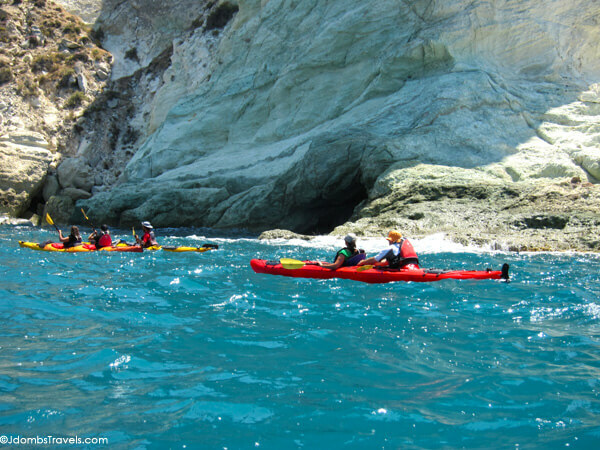 But we weren’t left too disappointed, the conditions were good enough to go sea kayaking Santorini’s south coast. We’d be visiting beaches only accessible by boat and kayaking among rocks rising out of the sea. Our small group of adventure travelers got a lesson on paddling technique and then it was time to get geared up. Tim and I had sea kayaked previously in San Diego, but it was hop in and go. For our 7 mile adventure to the deserted black sand Kambia beach, Tim would be manning our rudder with pedal power. To keep the water out of our kayak, we were each suited up with spray skirts. Each kayaker wears the skirts, which fit comfortably with suspenders and then cinch around your waist. Once seated in the kayak, the spray skirts are fitted around the kayak’s cockpit. See all the people hiking to Red Beach? Our guides timed the waves crashing into shore and gave a big shove, flipping down our tail rudder, and yelling for each kayak team to paddle! Bobbing, we each mastered turning and were off toward the Red Beach. It takes it name for the iron-rich sedimentary rocks towering above and around the beach and the red sand. Red Beach actually can be reached by foot along a very rocky trail and plenty of people make the 20 minute hike as it is always crowded. We paddled on, the spray of salt water picking up as we rounded the coast. The cliffs changed from red to black and then in complete stark contrast, white. The sea was roughest on our whole trip at this point and we got quite close to a sea cave that kayaks normally paddle in when the sea is calm. 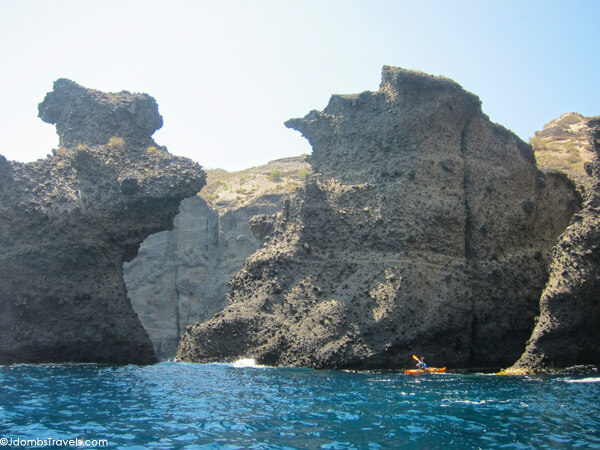 Photo courtesy of Santorini Sea Kayak – That’s us! The towering white cliffs give way to a little opening known as White Beach. Completely secluded, White Beach can only be reached by boat or kayak. Just about everyone in our group was ready to paddle out of this rough patch of sea and we paddled on toward Kambia Beach, where we’d rest and have a picnic lunch. As we came closer to the black sand beach, we discovered we weren’t alone. Some sailors hadn’t quite anchored their boat properly and had a surprise in the middle of the night when they were tossed into the rocks along the shore. The Greek version of the EPA was already on site helping to drain the gasoline and oil from the boat. After a picnic lunch and time to just rest or snorkel from the secluded beach, it was time to suit up and hit the sea again. This was perhaps my favorite part of the sea kayak trip along the South Coast. Huge rock formations began to rise up our of the sea like mountains towering above us. And inlets led to more sea caves dotting the shoreline. It was other worldly. While the sea was much calmer here than it had been near the White Beach, it still wasn’t safe to paddle into the sea caves, which you normally do when the sea is calm. We paddled back, this time the wind pushing us along. Big smiles were all around as our group reached shore once again. It was a success sea kayak trip! 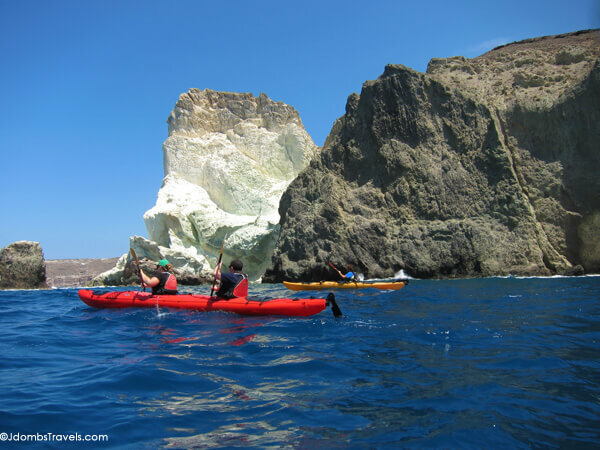 No one tipped, no one got sea sick, and everyone had beat the rough seas on an unusually tough sea kayaking Santorini trip. Bring a towel, swim suit, water shoes or sandals, and at least a liter of water. Santorini Sea Kayak provides dry bags to put your belongings in and has a small storage area at their shop for any bags you need to leave behind. Don’t worry about needing a water proof camera. Santorini Sea Kayak also takes photos of you during the trip and uploads them to Photo Bucket. You’ll receive an email with the link to your trip on Photo Bucket within a few days of your trip. Even more awesome, this service is free of charge. Our photos were taken with our Canon PowerShot S90 in the Canon WP-DC35 Underwater Housing and with our iPhone in a LifeProof case. 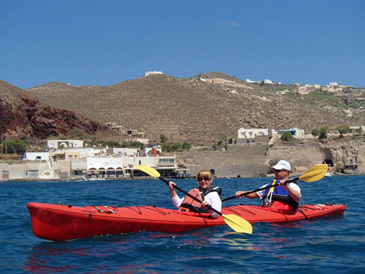 Santorini Sea Kayak South Discovery tour is great for everyone from beginner to experienced sea kayakers. Pick-up and drop off to your hotel is included. 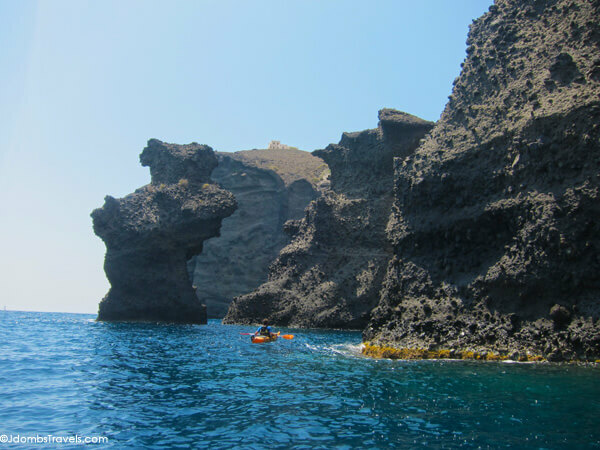 Our Santorini South Discovery trip was hosted by Santorini Sea Kayak in order to bring your this story. As always, we were in no way asked to write a favorable review and all opinions are entirely our own. This article also contains affiliate links. When you purchase anything on Amazon or book on Viator through our affiliate sites, we earn a small commission at no additional cost to you. Good job, good shots and very useful post. Everybody writes and shows the completely another side of Santorini, but not you. Thanks Victor! There is a lot more to discover in Santorini than just Oia and Fira Town, lovely as they are. 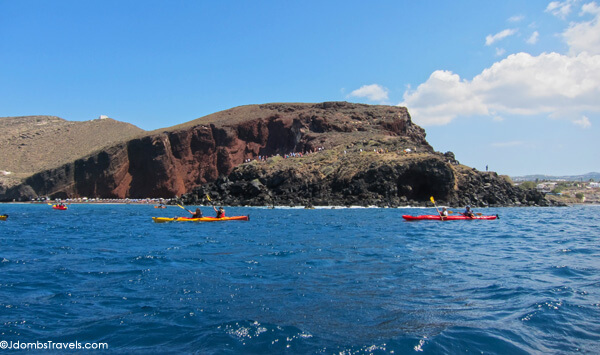 We’re so happy to showcase some off-the-beaten-path activities like sea kayaking. 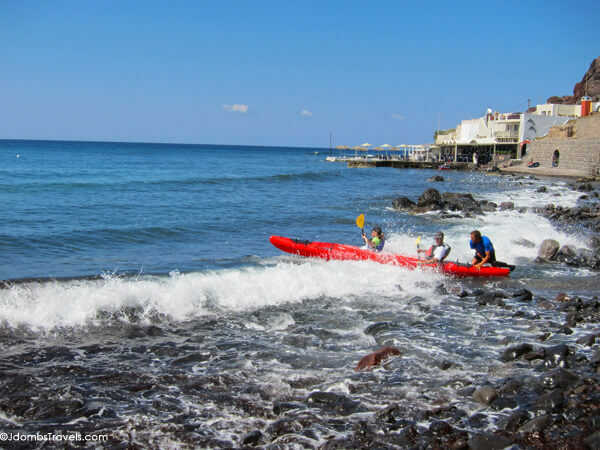 It just gives us reason to return again and have another sea kayaking adventure! We certainly were not disappointed with the changed route. Sea kayaking in both Abel Tasman and Fiji sounds amazing! I’m sure you’ll do it one day soon, Stef. that looked like a lot of fun, thanks for giving hints also on your cameras and housing unit esp since you were out on that georgeous water, the rocks and shoreline is stunning. It was our first time using the waterproof housing and the LifeProof case and jacket. We were pleased with how the photos came out from both! Wow. If I was going to try sea kayaking, this would be the place to do it! Beautiful! It was gorgeous! We loved it so much, we want to take up sea kayaking as much as possible when we travel. There’s actually an awesome sea kayaking trip around the Croatian Islands we’d love to do. These posts are really making me miss Santorini! Although we only did a fraction of the things you did. Most of our days were spent by our hotel pool, gazing out at the caldera. We went sea kayaking in Halong Bay and the paddling was much more tiring than I thought it would be. Luckily my husband was there to pick up my slack! If I sea kayaked regularly, my arms would look fantastic! 😉 I bet sea kayaking in Asia is gorgeous. I’ll need to check out possibilities for our trip to Thailand and Myanmar later this year. We do use a point and shoot sometimes (have even capture Northern Lights with this one!) but usually use our Canon EOS 7D with a variety of lenses. As great as the underwater housing worked, we’re not ready to trust our big camera will be a-okay. Looks like fun! I think if I ever try kayaking again, it has to be in a 2 person one. I wasn’t so crazy about paddling on my own when we did this in New Zealand, although that was mostly because I got attacked by sand flies. Don’t think I’d have that problem in Santorini. Oh no! Being attacked by sand flies doesn’t sound fun. Any tips for keeping them away in case we ever end up sea kayaking in New Zealand? And no, they were definitely not an issue in Santorini. What terrific wedding photos you take, Hannes! And we’re totally jealous that you’re in South Africa. That’s one destination that still remains on our bucket list. I went sea kayaking for the first time a couple months ago and I was surprised how different it was from river kayaking. I loved it and it looks like Santorini is a great place for me to go sea kayaking again, wow stunning photos. Where did you go sea kayaking, Freya? I don’t remember needing the skirt when we went in San Diego a few years ago. But with the waves we had, I was sure glad we had them to keep the water out! We’d love to do a multi-day sea kayaking adventure now. Absolutely love it! This looks like a lovely way to spend the day! Gorgeoos scenery. It was a fantastic way to spend our last day in Santorini. The scenery was definitely gorgeous! Kayaking is a great way to get a different perspective on a place… especially when it’s a popular touristy spot like this. Definitely agree, Bethany! We love getting off the beaten path and seeing a different perspective. We most definitely accomplished that with sea kayaking. What a fantastic looking kayak trip – and quite the launch. Was it a surf landing coming back in? It looks like a hot day too – one where you’re constantly happy to be taking the odd wave to cool down. It was a really fun kayak trip! The awesome guides helped everyone stay dry when coming back in. We’d each line up, wait for a wave, paddle a bit, and ride the wave straight in for the guides to catch us and pull us up on shore. It was quite windy, so didn’t feel too hot though the sun is brutal. The waves and spray definitely kept us a comfortable temperature. Had no idea sea kayaking was even as option when we were there! Looks like a ton of fun- guess there’s always next time! 🙂 love how dramatic those cliffs are! We hiked to the red beach and it wasn’t that bad! I’ve done plenty of hikes in my lifetime, but I’ve never seen the Red Beach. Would you recommend it? 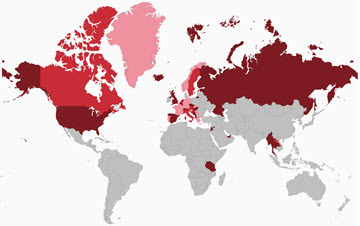 I also want to see Red beach. It would be nice I can imagine how it looks like. 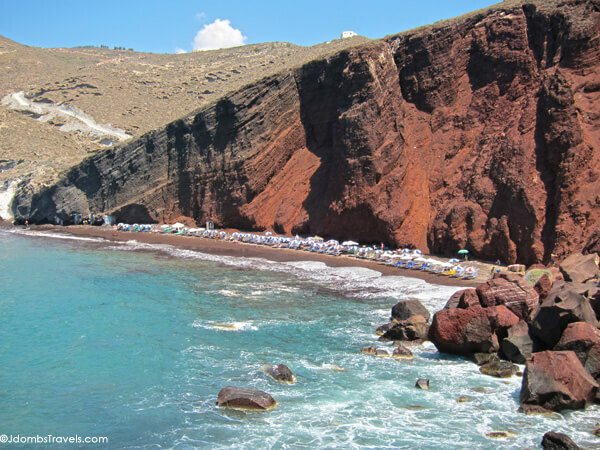 So this red beach is in Santorini?